The first castle in Wiener Neustadt was built in 1193-94, when at the same time, the city walls of Wiener Neustadt were built. The costs were paid from the ransom of Richard the Lionheart. This castle is said to have stood on the north-eastern corner of the city, but there is no archaeological evidence of this. When that castle became too small, a new castle was built on the present site by Leopold VI the Glorious at the beginning of the 13th century. Since the area is quite marshy, it was built on wooden piles. Under Frederick II the Warlike it was finally surrounded by a moat, outer walls and towers. 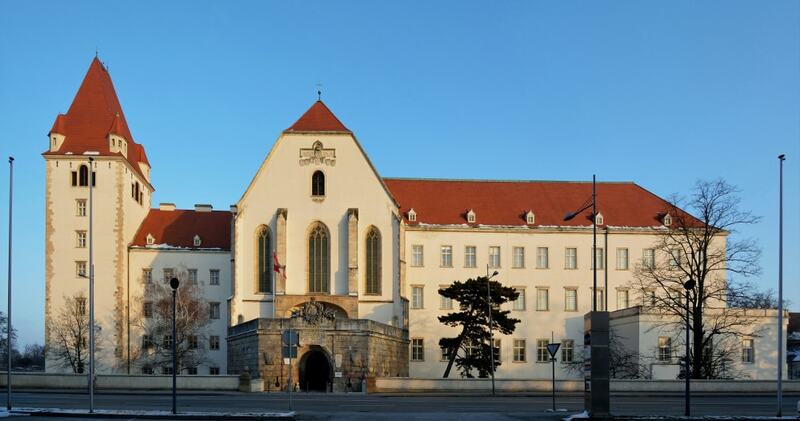 In 1751 the Theresian Military Academy was established in the castle by Maria Theresa of Austria. This involved numerous changes which were implemented by Viennese architect Matthias Gerl. The castle, which had always been the sovereign's property, is now owned by the Republic of Austria. The originally swampy area between the town and Leitha river was drained under Frederick III. The 106-hectare area was later converted into a park and has been open to the public since Maria Theresa.